Yes Saints fans, it still hurts. 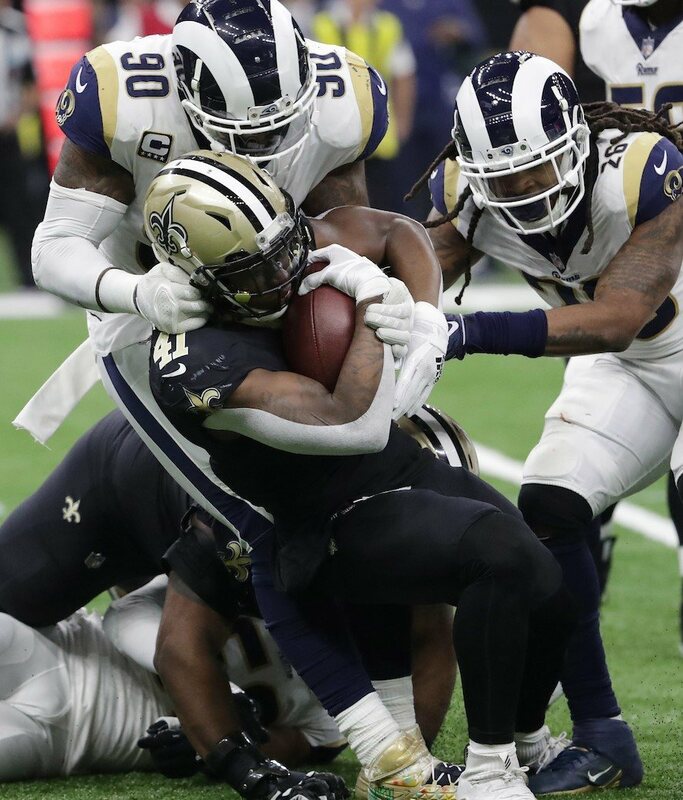 The emotional pain and mental anguish is still very fresh for Who Dats everywhere at the moment, following the team’s 26-23 overtime loss to the Rams in the 2019 NFC Championship Game over a week ago; a contest in which a blatantly-missed no-call by NFL referees virtually robbed New Orleans of its 2nd ever Super Bowl appearance. However, the organization in spite of its obvious disappointment with losing yet another post-season game in such heart-breaking fashion, must now gather its wits and begin making preparations for the annual off-season process. It’s a process which includes signing their current players that are pending free-agents; as well as the pursuit of new players for their roster for next season via 2019 NFL Free Agency (which officially gets underway on March 13th) and the 2019 NFL Draft (April 25th thru the 28th). However, just what is the team’s #1 off-season priority? Late in the season, teams figured out that if you could either slow down or completely shut down Kamara and Thomas, then the Saints had no one else on offense who could beat you. That’s mostly how the Cowboys beat them in that infamous loss at Dallas the week following Thanksgiving; and then other defenses like Tampa, Carolina, along with Philly and the Rams during the Playoffs, eventually followed suit with this same formula or “blueprint” for beating the Black and Gold. There are two positions within the offense specifically that fall into that category: a brand new starting #1 tight end capable of catching passes (to replace the now-retired Ben Watson); and a #2 wide receiver with the speed required to make big “home run” plays further downfield. There’s no way that the Saints will allow themselves to enter next season with Josh Hill or Dan Arnold as the starter at the tight end position. They need a tight end who can be an “impact player” on offense, specifically as a “target” for Brees on passing downs. Additionally, New Orleans had a very apparent weakness going into the Playoffs; which was the lack of receivers who could get separation, and that knew how to beat tight pass coverage. Except for Thomas, the Saints offense scheme simply lacked the experience needed after current #2 WR Ted Ginn, Jr. got hurt. Brees honestly didn’t have a whole lot to work with, and it became evident against the Rams when only 9 of his 26 completions went to WR’s. 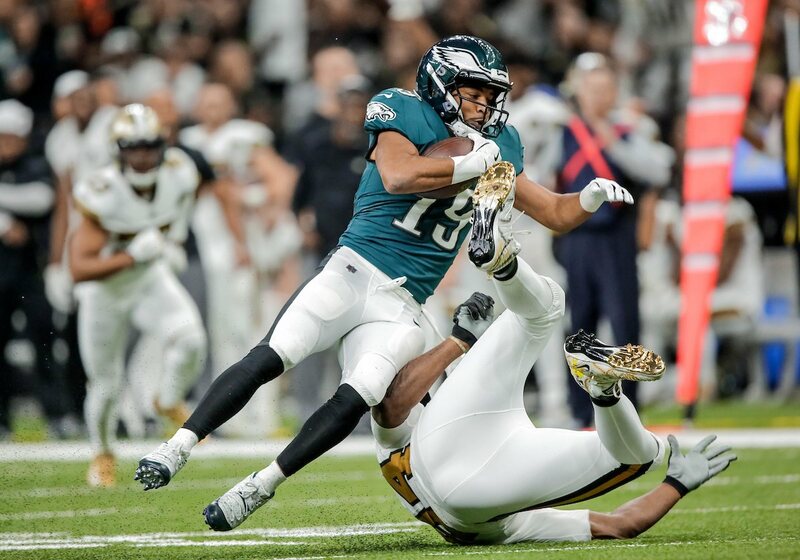 Also, with the uncertainty surrounding the return of players such as Dez Bryant and Cameron Meredith, as well as the inexperience and growing pains of rookie Tre’Quan Smith, the Saints need to add another receiver to the roster capable of breaking a game wide open. 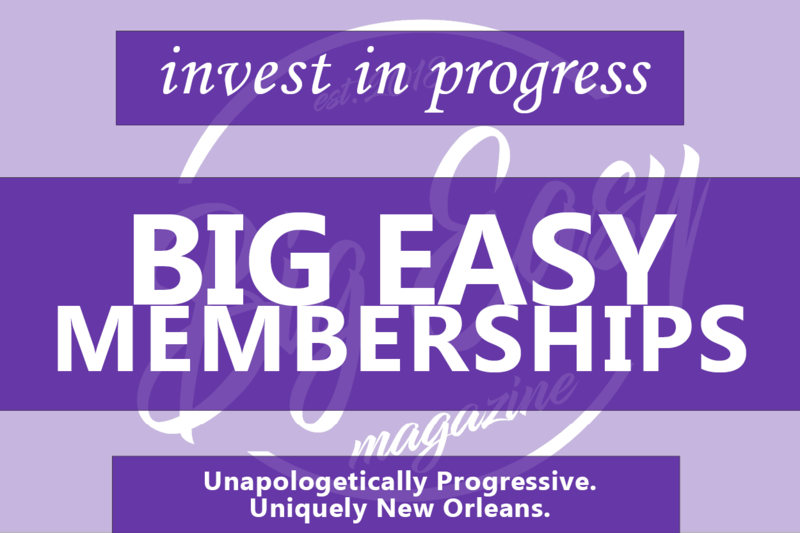 So with all of that in mind, this morning here at Big Easy Magazine we’re taking an early look at who some of those players might be, either through NFL Free Agency or the NFL Draft. Please remember: since the Saints have already traded their #1 pick in this year’s draft (30th overall) to the Green Bay Packers, they won’t pick until the 62nd overall pick in Round 2. Fortunately for New Orleans, this year’s tight end and wide receiver draft classes are both reasonably deep. We’ll begin first with the tight end position in both Free Agency and the Draft, followed by a few of the wide receivers that should be available for the Saints in either of those two occasions. Starting with the player that all Who Dats know and love (or hate, depending upon your point of view). Saints fans undoubtedly have a strong opinion about the now 32-year old former New Orleans superstar tight end, whom the Black and Gold traded to the Seahawks nearly four years ago in exchange for Seattle’s 1st Round 2015 Draft pick and center Max Unger. Graham fell out of favor with both fans as well as the Saints organization because he allegedly was considered to be a spoiled player (or a “prima donna”) who didn’t like to be hit or even “touched” during practice; and wanted to be pampered or treated better than every other player on the team. Now granted: those stories remain unsubstantiated, but obviously, there was a lot more going on “behind the scenes” than had been widely reported. 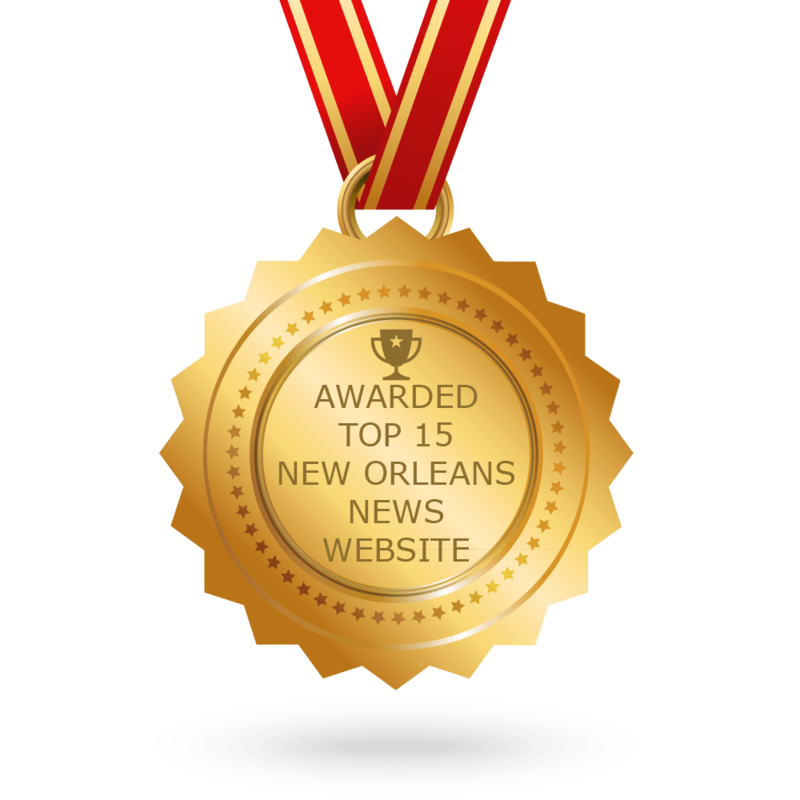 Following an uneventful rookie season, Graham shot to stardom In his 2nd year with the Saints in their NFL record-breaking 2011 regular season, as he set a franchise record with 99 catches for 1,310 yards and 11 touchdowns. Graham would go on to catch 256 more passes for 3,086 yards, and another 35 TD’s from 2012 through 2014, before the team decided to move on from him and try to find another player capable of matching his production. Unfortunately for New Orleans, that hasn’t happened since Graham left town. Graham had some modest success in Seattle (he made it to the Pro Bowl in 2016 and 2017); and even flirted with the possibility of returning last year to NOLA via last year’s 2018 Free Agency period, before he ultimately chose to sign a three-year, $30 million contract with the Packers. However, Graham had one of his worst seasons as a pro with the Packers (55 receptions for 636 yards and only 2 TD’s) in 2018. As initially reported by Green Bay Press-Gazette Packers columnist Pete Dougherty: Green Bay could be looking to cut Graham this off-season to give themselves more salary cap space as they rebuild their team under new head coach Matt LaFleur. Graham currently is set to receive a $5.3 million roster bonus on March 15th, so it’s a very distinct possibility at this point. The biggest question for the Saints would be just how much “gas that Graham has left in the tank”; and whether or not he could return to his previous old role as one of Drew Brees’ primary targets within the Saints offensive scheme. Graham is nowhere NEAR the player that he was earlier in his career, but given that the Saints likely are going to make one final run at winning the Super Bowl with the 40-year old Brees next season, Graham still would be a significant upgrade as a “weapon” / pass-catcher over the other tight ends that are currently are on the roster. Jared Cook has been named to AFC Pro Bowl Team. The 31-year-old Cook is still performing at a high-level after his 10th NFL season after he was initially drafted by the Tennessee Titans back in 2009. Cook had also played for the Rams (during their years in St. Louis before moving back to Los Angeles) and the Packers before he signed with the Raiders in 2017. Last year in spite of the Raiders’ at-times horrendous season that saw them finish with a (4-12) record, Cook had a stellar performance throughout the 2018 season; as he made it to the Pro Bowl after setting career highs in yards, receptions, and touchdowns. Many considered Cook THE top option in the Oakland passing attack for QB Derek Carr in each of the past two seasons, as he led them in receiving yardage during that very same period. In 10 NFL seasons, Cooks has played in 149 games (with 77 starts) and has caught 425 receptions (on 711 total targets) for 5.464 yards and 25 TDs. In 2018, Cook caught 68 passes on 101 total targets for 896 yards and 6 TDs. The Raiders are expected to do whatever it takes (a.k.a., offering him more money than any other potential bidder for his services) however to retain him, meaning that the Saints would have to make him a substantial financial offer. 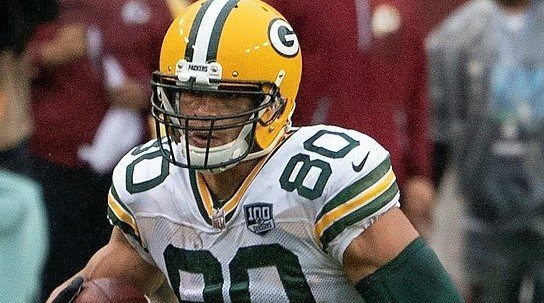 Like Graham, Cook is expected to be looking for a contract that pays anywhere between $7.5 and 9.5 million dollars per season; which is the going rate that top-tiered tight ends are expected to get once Free Agency begins on March 13th. Jenkins, a 2nd Round pick in the 2014 NFL Draft out of the University of Washington by the Saints’ division rivals the Tampa Bay Buccaneers, has been a bit of a journeyman throughout his short 5-year NFL career; with stops at New York (the Jets) and most recently the Jacksonville Jaguars last season. Saints fans might recall that the team briefly pursued Austin Seferian-Jenkins last season, but were eventually outbid by Jacksonville for the former All-PAC-12 tight end’s services; as he opted to sign a two-year deal with the Jaguars instead. However, his contract had a team option for next season, and Sefarian-Jenkins appears to be going with the presumption that he will be a free agent once again this off-season. However, the Jaguars front office has all the way up until the February 19th filing deadline to choose whether or not they want to bring him back into the fold and pick up his option for 2019. As of this writing, that’s still yet to be determined. In the 2018 Season, Sefarian-Jenkins appeared in only five games as he ended up on injured reserve after the Jaguars’ Week #5 loss at Kansas City, after catching 11 receptions for 90 yards and a TD. In his 5-year NFL career thus far, Sefarian-Jenkins has played in 43 total games (with 29 starts), caught 116 passes (on 190 targets), for a total of 1,160 yards and 11 TDs. Sefarian-Jenkins seemingly would make a great fit in the Saints offensive scheme; particularly given his outstanding receiving capability as a pass-catcher. However, there could be some concerns about him coming to play in NOLA; he is actually a recovering alcoholic. The prevailing thought among some observers is that Sefarian-Jenkins might find it difficult to resist the temptation of the famous (or infamous depending upon your point of view) New Orleans “nightlife” and the party-like atmosphere of the French Quarter; meaning that it would not be a likely situation for him. However, if the Saints coaching staff and his possible future teammates surround him with a positive environment (as we believe that they most certainly would), Sefarian-Jenkins could potentially be a great Free Agent pick-up for the Black and Gold if the Jaguars do decide to let him go. While James isn’t what you’d consider a household name, he has very quietly and modestly made a name for himself. All in spite of teammates such as QB Ben Roethlisberger, controversial “diva” WR Antonio Brown, budding young superstar WR JuJu Smith-Schuster, and season-long hold-out (and now former Steelers RB) LeVeon Bell hogging up all of the glory and front-page headlines in the Steel City of Pittsburgh. James, a 5th Round 2015 NFL Draft pick out of Penn State, is only 25 and quite literally “towers” over defenders at 6-foot-7 and 281 pounds. James lost his status as the Steelers #1 tight end to teammate Vance McDonald this past season but still managed to grab 30 receptions (only 20 fewer than McDonald’s 50) for 423 yards and 2 TDs. Despite that, James (very quietly and “under the radar” so to speak) still caught 113 catches over the past three seasons, an impressive stat given Pittsburgh’s distribution to their wide variety of offensive weapons. In his 4-year NFL career, James has played in 56 games, caught 120 passes for 1,189 yards, and has scored a total of 9 TDs. James definitely isn’t the fastest TE in the League (he ran a 4.86 seconds 40-yard dash coming out of college), but he’s an outstanding blocker (the Steelers often used him to help “seal the edge” for Le’Veon Bell to bounce outside on running plays) and apparently is a sure-handed receiver. Think of him as a slightly slower Josh Hill (a great blocker), but with Jimmy Graham’s receiving ability (a great pass-catcher). This young man might be one of the most underrated players of this coming year’s entire 2019 NFL Free Agency Class. TE Tyler Eifert is up to jogging 20 minutes at a time after the injury that cost him most of the 2018 NFL season. In his six years at Cincinnati, Eifert has never played a full 16-game season for the Bengals. To be perfectly blunt and completely honest: the only reason anyone is going to give this guy a big contract in Free Agency is that when he is healthy, he is one of the best young tight ends in the sport of Pro Football. There’s no question about it that when he is fully healthy, it’s hard to find a tight end in this year’s Free 2019 NFL Free Agency Class who is any more dynamic than Eifert, who will turn age 29 in September. Eifert’s biggest problem has always been that he can’t seem to ever stay on the field long enough to make a lasting impact. The guy is practically a walking and breathing M*A*S*H unit, for crying out loud. As a 1st-round pick by the Bengals during 2013 NFL Draft from the University of Notre Dame, Eifert has spent more than half of his career on the sidelines. He missed 53 out of a potential 96 regular season games due to a wide variety of injuries. He’s suffered everything from a concussion, several stingers, a severe elbow injury and a torn labrum, an ankle surgery, multiple disc repairs in his back, a cleanup in his knee, and then last season, a grotesque broken right ankle injury that landed him on injured reserve following Cincinnati’s Week #4 win at Atlanta against the Falcons. Amazingly, despite all the injuries, surgeries and rehabilitation, Eifert has never considered retiring. In his 3rd NFL season back in 2015, Eifert had 13 touchdowns and was virtually unstoppable in the red zone. However, since that time in the last three seasons combined, Eifert has only played in 14 games (out of a possible 48) with two starts. With Eifert’s career appearing to be in serious jeopardy should he sustain another injury, it means that he’ll more than likely be willing to sign a contract with minimal guarantees if he and an interested team (the Saints, perhaps?) can negotiate an incentive-based deal. However, it just seems like too big of a risk for the Black and Gold to take. Given how they’ve been “burned” in the past with other injured players in Free Agency such as Jairus Byrd, C.J. Spiller, Coby Fleener, and most recently with Cam Meredith just last year, it might be considered a bit foolish by some observers to even consider giving Eifert a deal that he might not ever be able to fulfill. Congrats, Irv Smith Jr. on being named Semifinalist to the @JohnMackeyAward. With former Saints starting TE Ben Watson now retired, back-up Josh Hill is now the Saints’ new #1 TE, but he doesn’t exactly warrant being labeled a “star” at his position anytime soon. With undrafted free agent Dan Arnold still learning HOW to play tight end, unless the Saints shell out some big bucks for one in Free Agency, they are in a very obvious and quite frankly a dire need of an upgrade at the TE position. Also, given that New Orleans will be picking at the bottom of Round 2, it means they still should have a crack at selecting a player who barring any serious injuries, should go on to experience a stellar NFL career: University of Alabama tight end Irv Smith, Jr. The 20-year old Smith, who is a NOLA native and a graduate of local New Orleans institution Brother Martin High School, is also the son of former Saints top 1993 NFL Draft pick Irv Smith, Sr.
SB Nation NFL Draft analyst Timor Dimini says that Smith is a high-effort tenacious football player who not only has obvious NFL bloodlines but is also a young man who embraces the opportunities to improve his game and always seems hungry to succeed. In 13 games this season, Smith caught 38 receptions for 648 yards (17.1 average yards per catch) along with seven touchdowns; after playing sparingly as a sophomore in 2017; when he played in 9 games and only caught 14 passes for 128 yards but with 3 TD receptions. The 6-foot-4 inch, 241-pound junior prospect essentially is a one-on-one mismatch in the middle of the field for any defender; which is not all that surprising given that he possesses an impressive blend of size, speed, explosion, and athleticism. Smith notably can take advantage of opposing defenses with his speed “up the seam,” but yet he’s still “crafty” enough to create separation for himself by utilizing his impressive length and athleticism to find holes where ever he possibly can in zone coverage. Along with good catching and great YAC (yards-after-the-catch) ability, Dimini adds that Smith’s blocking has shown significant improvement as well, something that no doubt would earn him “bonus points” with Saints head coach Sean Payton. With all of the top TE prospects expected to be gone by the time that the Saints get on the clock, their best option will be looking at candidates from the proverbial 2nd tier of players such as Irv Smith, Jr. whom we listed above, or a young man like “sleeper” prospect Josh Oliver of San Jose State. Bleacher Report NFL Draft analyst and resident expert Matt Miller says that Oliver is one of this upcoming class’s biggest “sleepers”. Standing at 6-foot-5 and 250 pounds, Oliver is a big-time target who has shown the athleticism needed to become a vertical seam target and red-zone option. Oliver exploded onto the scene despite the Spartans’ losing record, and caught 56 passes for 709 yards and 4 TDs. In his entire career, Oliver tallied a total of 98 receptions for 1,067 yards and 7 TDs. Miller adds that Oliver also has the speed to take linebackers and safeties down the field and has shown the agility and explosion to be a threat over the top or when attacking the ball in the air. Miller believes that Oliver will project best in the NFL by fitting within an offense that doesn’t ask the tight end to stay in-line and block but will let him move around the formation and find the best match-ups. That’s something that undoubtedly would prove quite beneficial to the Saints offense, and a reason why Oliver should be an option for the Black and Gold with the 64th overall selection. It shouldn’t come as a shock at all that many Saints fans are already well aware of the capabilities that Tate possesses, even though he will turn age 31 in August and whom surely is nearing what some would now consider the tail-end of his brilliant 9-year NFL career. Tate has even earned the nickname “The Saints Killer” among some of the oldest and most loyally-devoted of Who Dats (who have seen many a good receiver play at the old Tulane Stadium and then at the Mercedes-Benz Superdome throughout the past 52 years), because of his notable performances against New Orleans over the course of the past several seasons. As noted by the good folks over at Pro Football Focus: Tate in what will be his 10th NFL season in 2019, remains as a big-play threat with unparalleled consistency in making things happen after the catch. The wily veteran rather impressively was still able to force at least 20 missed tackles in each of the past seven seasons dating all the way back to the 2012 season, and PFF notes that Tate has averaged 5.4-plus of YAC (yards after the catch) per reception in that same period. The former University of Notre Dame All-American was initially drafted by the Seattle Seahawks back in the 2010 NFL Draft (where he played for 4 seasons), and has also played for the Detroit Lions (2014-2018) before he was traded to the Eagles just hours prior to the 2018 NFL Trade Deadline at the end of October. In 2018 with Detroit (seven games) and Philadelphia (nine games) combined, Tate caught 54 total passes for 795 yards in two different offensive schemes, a testament to his high-level football IQ as well. In nine NFL seasons, Tate has played in 140 games (with 101 starts), caught 611 receptions (on 904 targets), for a total of 7,214 yards and 38 TDs. Make no mistake about it: while Tate isn’t the quickest or the fastest WR in the League, he most certainly is among the more reliable and consistent ones; and that makes him still a valuable commodity to a team that could use another offensive “weapon” like New Orleans. The only thing that might finally stop “The Saints Killer” from hurting the Saints once again in the future might be by paying him to put on a Black and Gold uniform in 2019. If Saints team management is smart (and we already know that they are), then it has to be glaringly obvious to them that their receiving game was virtually non-existent throughout the entire 2018 Season, outside of 3rd-year superstar WR Micheal Thomas. 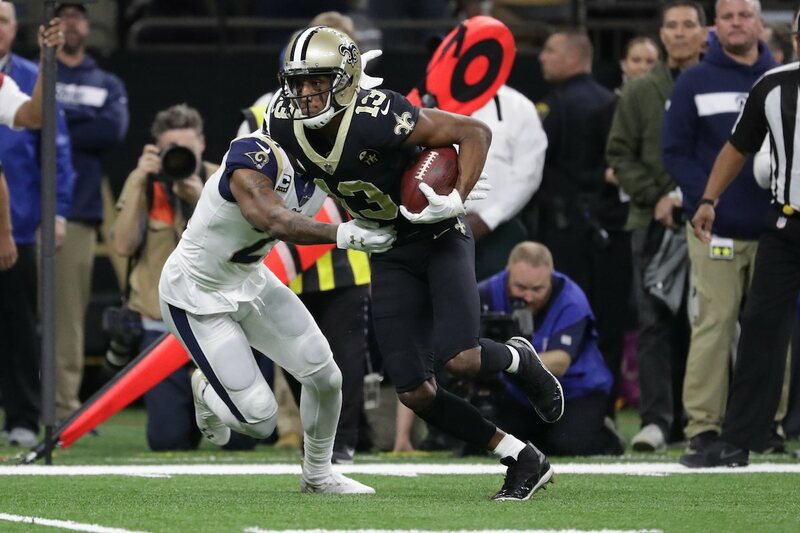 While it’s important to note that the Saints ended up not getting much from injured veteran players Cam Meredith (knee) Dez Bryant (torn Achilles tendon), and Ted Ginn, Jr. (knee), they were able to get some minor production from rookie 3rd Round 2018 Draft pick Tre’Quan Smith and undrafted rookie Keith Kirkwood. However, let’s be perfectly honest here: neither of those two youngsters is “world beaters,” by any stretch of the imagination. Standing at 6-foot-4 and 205 pounds, the 26-year old Williams would make for an ideal complement to Thomas, who generally lines up in the designated “slot” position. Out in sunny California (Carson, CA to be exact), Williams was able to thoroughly utilize his unique blend of size and speed to his distinct advantage as an “X” (a.k.a. “split end”) or a “Y” receiver (a.k.a. “flanker”, which is what the Saints truly need) for the resurgent Chargers, and he has shown a propensity for jaw-dropping play-making ability in some key moments. Triple coverage? No problem for Chargers WR Tyrell Williams. Last year out in the LA suburbs as the Chargers’ new stadium was (and is still) being built, Williams caught 41 passes for 653 yards and 5 TD’s, and that was as the #3 WR behind starters Keenan Allen and Mike Williams in the Chargers offense. In his 4-year NFL career, Williams has played in 52 games (with 37 starts) and had 155 receptions (on 258 targets) for 2,530 yards and 17 TDs. Considering that the undrafted (2015) former small school “superstar” from Western Oregon University is just now entering into the prime of his young career, signing him and putting him next to Thomas along with a hopefully soon-to-be-blossoming young star in Tre’Quan would leave the Saints receiving corps in very good hands heading into the future — regardless of how much longer Brees sticks around. Some Saints fans will scoff at the notion of signing a 5-foot-9 inch, 179-pound wide receiver who body-size is more suited for the PGA Golf Tour or with an NBA basketball team than it is to be playing in the NFL, but understand the logic behind it (which you can bet Sean Payton does). Since Thomas spends most of his time in the slot, Brees (and whoever the QB ends up being after he’s gone) could use another speedy target lined up outside of Thomas. Ted Ginn, Jr, technically has that role, but that’s only when he’s healthy. However, he’s now also 33 years old and will be 34 very soon, which is a logical reason why former Arizona Cardinals 3rd Round 2014 Draft pick and Baltimore Ravens soon-to-be free agent John Brown could come into the picture for the Black and Gold. Some Who Dats might recall that Brown was a THREE-TIME “Small School” All-American at Division II school Pittsburg State (actually located in Kansas but founded by Pittsburgh, PA natives that settled the area during the late 1800’s), which is about 2 hours south of Kansas City, Missouri. It was there that Brown initially blew away NFL scouts with his “triple-threat” capability at receiving, rushing and returning kicks. In fact: if the Saints were to sign him and let him return kicks, he would be the most dynamic Saints return man since Reggie Bush’s rookie 2006 season, and will remind older Saints fans of late 1980’s “Dome Patrol” / Jim Mora Era wide receiver and kick returner Mel Gray (but with far superior receiving skills). Brown could be considered a “poor man’s version” of former All-Pro and current Tampa Bay veteran superstar WR DeSean Jackson because of their very similar size and capabilities. In 2018, Brown caught 42 passes for 715 yards and 5 TD’s, In his 5-year career (the first 4 with Arizona), Brown has played in 72 total games (with 42 starts), and caught 215 receptions (on 428 targets, which is a ton of “deep balls” thrown) for 3,230 yards and 22 TD’s. The Saints have to be careful and avoid overpaying for Brown, who although he still isn’t considered to be a “superstar” player on Thomas’s level, is nevertheless coming off a season with Baltimore in which he tied for 4th overall in the League (alongside Chiefs “triple threat” WR / KR Tyreek Hill) in total yards per catch (17.0). Brown has much upside for a player his age, and could potentially flourish if placed with the right team, and in the right situation. One thing for sure that he’d bring to NOLA if he signed with the Black and Gold: an experienced player that has the God-given talent to put up 1,000-yard seasons, and has 22 career touchdowns to his credit in spite of never having been a #1 WR. Even better: he’d be an immediate upgrade over any other Saints WR opposite of the often-double covered Saints #1 WR Michael Thomas. #SouthCarolina WR Deebo Samuel had a great first day at the Senior Bowl. With current #2 WR Ted Ginn Jr. about to turn age 34 and soon-to-be 2nd year player Tre’Quan Smith appearing to have struggled at times to fully digest the Saints offensive scheme, a complementary receiver that can become a legitimate threat on the outside and create problems for opposing defenses opposite of Saints split end/#1 WR Michael Thomas is what the Black and Gold still needs to improve its passing attack. The Saints most certainly will look to improve this position in free agency, but the addition of a player capable of having an immediate impact might have to wait until the draft. Also, once the Saints finally do get ‘on the clock,’ the VERY BEST player still likely to be available by that point will be none other than the University of South Carolina WR Tyshun “Deebo” Samuel. Samuel had 62 receptions for 882 yards and 11 receiving touchdowns in 2018 but decided to end his final season by sitting out the Gamecocks’ bowl game against the University of Virginia. USA TODAY Draft Wire analyst Gavino Borquez says that the 5-foot-11, 200 pound Samuel has explosive quickness and is just too fast for corners to cover on “go” or “fly” routes. Samuel eats up cushion and runs by most defenders with ease, and Borquez notes that the soon-to-be 23-year-old senior is the type of player that NFL coordinators will scheme plays for to get the ball into his hands. However, Samuel isn’t merely some “speed demon” that can turn a short gain into a touchdown in the passing game but additionally is a top-rated kick returner as well. Samuel returned 23 kickoffs for 570 yards, tallying a 24.8-yard average. In this past weekend’s annual Senior Bowl college all-star game in Mobile, Alabama, Saints brass was in attendance watching on as Samuel put on a show for NFL scouts with a dazzling display of his various capabilities. Bottom line: Samuel could be the “missing piece” in the Saints passing attack opposite of Thomas, and should still be sitting there once New Orleans is on the clock for the 62nd overall selection. He would make complete sense not only to be a part of the Saints present, but very likely would become an integral part of their future as well. While some Saints fans might get a chuckle at the thought of selecting a player from a little-known Buffalo University in upstate New York, it’s important to remember that the school has turned out some pretty notable players in past years. Examples include former NFL RB’s James Starks (Green Bay Packers) and Brandon Oliver (then-San Diego Chargers), and of course the one player that could cause some problems for the Saints heading into next season: current Chicago Bears EDGE Pass rusher and previous League Defensive MVP candidate Khalil Mack. However, this coming April’s 2019 NFL Draft class will feature a player from the Bulls program that his quietly put his name “on the map” for professional scouts everywhere: senior wide receiver Anthony Johnson. The 22-year old is a player whom SB Nation NFL writer Ben Natan says has been as productive as ANY wide receiver at any level of college football, in the last two years. After 14 touchdowns and over 1,300 yards last year, Johnson had 11 TDs through the air this year — but yet remains as one of the upcoming Draft class’s most underrated stars headed into late April. At 6-foot-2 and 210 pounds, Johnson is a deep threat who has demonstrated his ability to “take the top off” of a defense; as evidenced by his rather notable performance earlier this season against a much bigger school / opponent in the University of Minnesota Golden Gophers of the Big-10 Conference, a game in which Johnson had 11 receptions for 140 yards and a touchdown. Some analysts even feel Johnson just might be THE BEST “deep threat” in the sport right now, either college or pro level. That’s quite a remarkable observation, given the considerable amount of collective talent that currently exists at both classifications. Johnson has demonstrated an impressive knack and ability to catch the football over his shoulders and can contest “50-50” balls that are thrown against defensive backs in man to man coverage. Additionally, Johnson has demonstrated an astute level of awareness that’s allowed him the ability to gain a majority of his receiving yards after making the reception (YAC). Small school “superstar” he might be, but believe this much: Johnson looks as if he will eventually become a BIG-TIME star, in the National Football League. That’s something that no NFL team — including the Saints — can have “too many” of. It should come as no surprise for Saints fans to see a player from Ohio State on this list, given the team’s very notable affinity in recent seasons to target and acquire players from that school’s top-notch and historically successful program. And make no mistake whatsoever about this much: the 6-foot, 208 pound Campbell is an explosive play-maker whom Bleacher Report NFL Draft analyst Alex Eisen says can stretch the field, possesses great burst and blistering speed off the line of scrimmage, and is expected to be one of the fastest prospects (an incredible 4.26 40-yard dash time) in next year’s draft. That’s ironically the same type of speed (4.28) and talent that former Buckeyes star and Saints veteran Ted Ginn. Jr. himself once had as a younger player coming out of Ohio State back in the 2007 NFL Draft, and Campbell has drawn obvious comparisons to the Saints 12th year veteran wide receiver. However, Ginn turns age 34 in April; Campbell clearly would appear to be a more-than-viable replacement given their very notable similarities. The 21-year old caught 79 passes for 992 yards and 11 TD receptions in 13 games played. During his entire 3-year career in Columbus, Campbell tallied 132 total catches for 1,697 yards and 14 TDs. Eisen notes that Campbell can run at all three levels, running the short, intermediate, and deep routes. There is a very distinct big-play ability that would come with a potential selection of Campbell, which is something that the Saints clearly like to have at the position and have done so in the past; with players such as Devery Henderson, Robert Meachem, and most recently: former 2014 top draft pick and current Rams WR Brandin Cooks. As of this moment, Campbell is listed by a majority of draft analysts as a Day 2 selection — and should be a player who definitely can help the Saints upgrade their roster at a position of need.